Home / Service dog / How Can I Turn My Pet Dog into a Service Dog? Service dogs by definition are dogs that are trained to assist and empower people with disabilities. They are the professionals of the dog world and include leader dogs for the blind, therapy dogs, hearing assistance, physical assistance, and security dogs. For a dog to be considered a legal working service dog, protected under the ADA, it must be trained to perform special jobs and tasks that are specific to its handler's disability. This type of dog is very different from a pet - even if the pet knows many tricks and is extremely well behaved. Basic tricks such as sit, stay, roll over, heel, speak, shake, etc. do not count as tasks or jobs under the ADA. Even if the pet has undergone many types of obedience classes. 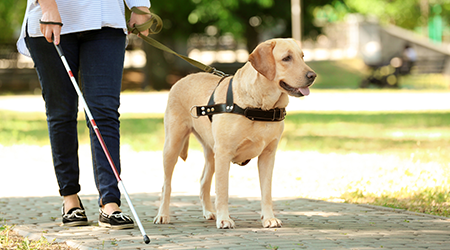 The type of tasks that service dogs perform includes alerting their handler of low blood sugar, guiding the blind, pulling a wheelchair, bringing in groceries, picking up dropped objects, keeping their handler from danger, etc. It takes around 2 years of training for a dog to become a service dog and can cost their handlers thousands of dollars. They are solely trained to help enrich people’s lives that have different types of disabilities. While the handler does consider these dogs as their pets when they're off duty, as soon as the dog is out in public, working and performing tasks, it is not considered a pet. Instead, they are the equivalent of medical equipment required due to a disability, just as a wheelchair is considered a necessity for people unable to walk. Also, it is not required for the handler to show any type of certification, ID, or proof that they have a disability or that their dog is a service dog required because of their disability. Many people who obtain certification are doing so to pass their pet off as a fake service dog. This is illegal and punishable by law. Realistically, probably not. It takes a ton of training. It's possible to teach your dog little tricks like picking up dropped items, and opening and closing doors to help you out around the house but if you're in need of more help than that and you want a dog that you can take in public, then you'll need an actual working dog. Most training programs breed dogs with the intent of training them into service dogs and they start the training when they're a puppy. It can take 2 years of training until the dog is ready. Once you've applied for a dog, you'll be put on a waiting list and the program will try to find the best match for you. Once they find the perfect match, both you and the dog will undergo 3-4 weeks of training together to teach you how to work with your dog and to create an unbreakable bond. What are the differences between "work" and "tasks"? A task is defined as a piece of work to be done. In regards to working dogs, it's a specific thing that has only one result. For example, cuing the dog to open the door will result in the door being open. Work (also known as a job) is defined as an activity or effort done in order to achieve a purpose. For working dogs, a group of several tasks can be considered work. For example, saying that your service dog is "on duty" or "at work" means that the dog is currently in the process of completing several different tasks to achieve a purpose. How Can I Turn My Pet Dog into a Service Dog?